A weight watchers smoothie made with raw nuts, seeds, coconuts, and other healthy ingredients are perfect for anyone looking to satisfy their sweet tooth and to add more nutrition into their diet. They can be lower in calories and higher in fiber than other processed desserts! Weight loss smoothies really depend on which ingredients you decide to use. Drinking a 16oz milkshake from a fast food restaurant can easily contain over 600 calories, if not more. Also... they only give you one gram of fiber. Several fast food shakes have about 17 points each! WOW! No wonder we can't have desserts if we need to lose weight. If you plan out your smoothie ingredients, you can enjoy healthy desserts! 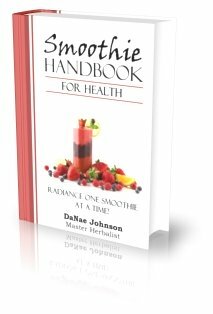 Under each smoothie recipe, I have calculated the calories, fat, and fiber content. For your convenience, I labeled all of the smoothies with how many points they contain. I did calculate these recipes as one serving. But when I blend up my smoothies, I usually split the smoothie with someone else. If you don't have someone to split with, you could drink half of the smoothie and save the other half for another snack some other day. Just freeze it. When you want the other half, take it out to thaw for 10-20 minutes. Enjoy! I hope this is a great help to you in your journey of becoming healthier! Please feel free to submit your own smoothie recipes. Interested in other types of weight watcher friendly smoothies? I understand that you have better things to do with your time than count calories, sugars, and protein every time you blend up a smoothie. So...in my book, "Smoothie Handbook for Health", I’ve done all the up-front work for you. I’ve calculated the calories, fat content, sodium, carbohydrates, fiber, sugar, and protein, as well as the percentages of Vitamin A and C, calcium, and iron. Then I went the extra mile and also added up the Weight Watcher points (including the new PointsPlus system)!